We’d love your help. Let us know what’s wrong with this preview of The First Untrue Trilogy by Teel McClanahan. 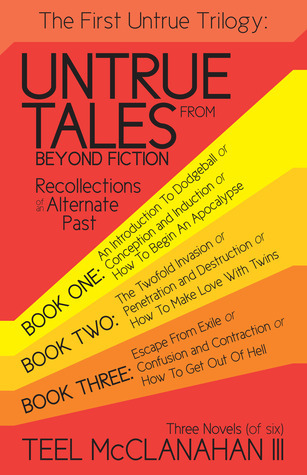 To ask other readers questions about The First Untrue Trilogy, please sign up. Honestly, when I started this book I thought right away that I wouldn't like it... mostly because it's way out of my comfort genre. But, I read it anyway and I was pleasantly surprised. There were times when I thought that Teel had to be high as a kite to come up with some of these concepts, but kudos to him anyway. I feel like I understood the book; however, I know without a doubt that I could never explain it to anyone! I am looking forward to the next one, but I need to dip back into YA for a Honestly, when I started this book I thought right away that I wouldn't like it... mostly because it's way out of my comfort genre. But, I read it anyway and I was pleasantly surprised. There were times when I thought that Teel had to be high as a kite to come up with some of these concepts, but kudos to him anyway. I feel like I understood the book; however, I know without a doubt that I could never explain it to anyone! I am looking forward to the next one, but I need to dip back into YA for a little bit first and let my brain relax! The ONLY thing I didn't like was that some of the sentences were so long... very winded at times. I even had to reread some sentences to make sure I didn't miss anything. Harry Potter on steroids! Read the entire series! I never know where this author will take the story and that makes for lots of anticipatory fun.